Today we went to the Mt. Madonna Center (http://www.mountmadonna.org/) near Gilroy, CA. 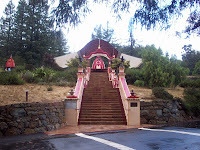 An ashram of the Hanuman Fellowship inspired by Baba Hari Dass. Good day to go as well, it's the 6th day of Navratri. It was a cool rainy day. The drive is so beautiful...up through the coastal hills, tall evergreens... even redwoods... on a curvy road. The rain had made everything look so fresh. 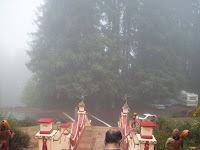 When we reached, the ashram seemed ethereal, set on top of a mountain, a long flight of steps leading up to a small Hanuman temple, surrounded by tall trees, a beautiful panoramic view of the Santa Cruz valley and the Pacific Ocean. The priest blessed us with a Tilak of sandalwood paste and then Kumkum. We paid our respects and sat in silence for a few moments. Cool breeze, mist and rain and of course the serene presence of Hanumanji, ah! so blissful, we forgot the world for a while. 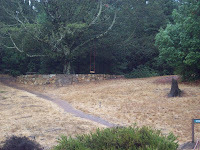 It was starting to rain and we ran into the meditation hall. Baba was there talking to those gathered around him. We got ourselves a hot cup of Chai and sat down near the window, looking out into the valley and ocean, clouds rolling and sun shining in the distance. 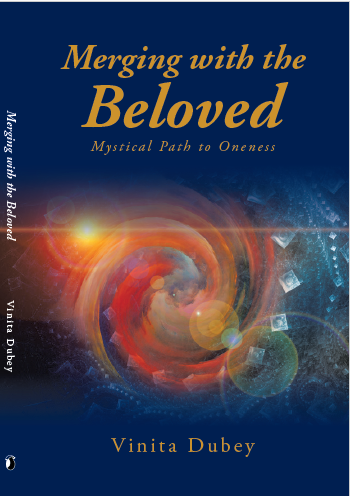 I felt so much stillness and silence, a separation from an inner core and outer shell. The feeling of the place was so calming, the devotees who live and work here seemed so blissful, it felt like they were on another plane of existence! I told my friends of my first visit here. I had closed my eyes for a few moments in the meditation hall (where Baba sat now) and felt so much energy, I wanted so much to do an Art of Living course here...and my wish came true a few months later in the form of the Blessings course. We strolled through the bookstore and glanced through beautiful arts and crafts. It was time to go already, bid farewell to Hanumanji. Many years ago at this time He was busy finding the Sanjivani to heal Lakshman (just before Dussera). 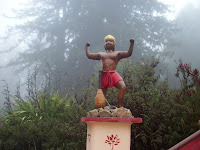 Swami Suckchaitanya of the Art of Living ashram in Canada has very beautifully described the meaning and connection of Sri Hanumanji - Vayu putra - and the breath. It's part of the music CD "21st Km" by Keerti Mathur. Very soon we start driving down the mountain from the abode of Hanuman to the world below, from the ethereal to the real, to world of: the Financial Crisis, the Bailout Plan, Sarah Palin...ok that's scary enough!